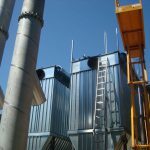 A biomass thermal power plant is a power station that can generate heat by burning fuel: can be methane, diesel fuel, or as in the case we report below designed by SMEA Engineering, biomass (eg, wood chips). The heat generated is transferred to the water pipes, and from there you can use it as you prefer, to heat houses, offices (we talk in this case about district heating), or use it for industrial needs (it’s just that our scope, and now we’ll propose an example about this type of application). The operation then, is very similar to that used by the condominium boilers, however powers, scope of use, and especially in this case the fuel is different, and it is actually a real renewable source. To describe the biomass thermal power plant operation, we use a practical example actually made, a result of SMEA Engineering industrial design, examining the response to the needs of one of our customers to generate heat for the drying of tobacco, no longer using fossil fuels but renewable energy: wood chips. Before going further it’s good to have an overview of the situation, and then go into the plant operation details. Before the upgrade, each furnace for the drying of the tobacco was equipped with a burner fed with gas oil and with a heat exchanger air / flue gas. The hot fumes warmed incoming air to furnaces that goes to dry tobacco, thanks to a fume / air exchanger. In this configuration there was a distribution network of gas oil from the reservoir tank to bring the fuel to every drying oven. Each oven had in fact its own oil burner. The customer as anticipated, decides to switch to renewable sources of fuel type, by shifting their own choice on the wood chips. So begins the design and implementation of new thermal plant biomass. It is decided during the plant design to disassemble oil burners of each oven, dismantle the oil gas line, and replace the battery exchange with another equipped with air-water heat exchanger. In fact in the post-construction state, the air going to dry tobacco must be heated by hot water that comes from the new biomass boilers. The biomass thermal power plant is constituted by two heat generators and is fed with solid plant biomass having a moisture content of maximum 40% by weight, and a particle size of not more than 3 cm. The boilers are equipped with charging systems that will ensure independent and autonomous life of at least 24 h.
Is possible to modulate the power output within a range from 5 to 100. The steam generators operate in constant depression both in the combustion chamber and in the flue gas ducts. The boilers are equipped with extraction systems ashes from the primary combustion chamber via screws; they are built to make easy and safe the cleaning operations of the combustion chamber, the heat exchanger flue gas / water and the flue gas treatment. To cope with any unexpected on biomass boilers, is installed a security emergency boiler fueled by diesel. The boiler is activated only in case of biomass boilers inhibition. Each generator is equipped with all the safety systems required by the regulations in force. The thermal plant is equipped with a suitable water station wich push the liquid to the heating district network, this system is designed to ensure adequate supply to the network is proportional to the heat demand. The adjustment of pump flow occurs through the inverter, and everything works fully automatically by the PLC which detects the number of dryers operating and their individual thermal needs. Each pump has a soft start to preserve the mechanical parts and to avoid water hammer. The plant is also provided with heat cost counter that can record the thermal energy produced and distributed. To prevent the failure of a single dryer affect the correct plant operations, the latter is equipped with check valves and shut-off as well as of all the instrumentation necessary for the proper monitoring. All the used components are in accordance with CE low. The district heating network is designed to power the entire drying center following a precise pattern that is delivered to the client. The pipes are implemented in stainless steel so that there are no corrosion problems and are insulated with suitable material capable of withstanding the expected temperatures, and are then coated in aluminum sheet in order to preserve the status. The stirrups (stainless steel as well), is designed to support the load and ensure its proper expansion. The piping is made to permit easy access to the boiler room and inside the drying plant allowing to conduct properly the possible maintenance of the installed components. As for the drying ovens, each of them is constituted by a heat exchange coil with a high coefficient of exchange and a minimum resistance to the process air flow. The network is designed for the homogeneous distribution of the water within the various exchange batteries. Every single furnace is therefore equipped with modulating valves for water and air control, and these will be equipped with a potentiometric reference in order to interface correctly with the PLC. They shall guarantee a modulation range 0 – 100 with inlet water temperature of 110 ° C.
Every single furnace is also equipped with independent electric panel in order to ensure operation even under remote management and remote control system fault conditions, each in turn provided with temperature probes able to control the inflow and reflux to the oven, moisture probes to control the water content present within, as well as all control systems, regulation and control of all the electrical components in the oven such as the engine fan, water valve and air valve. Each framework has in its interior a PLC able to guarantee the cure in the oven automatically even in absence of connection to the central PLC, and is equipped with a system of manual operation in case of failure of the automatic system or any component such as probes or servomotors. At the end of the work, therefore, you will have access to a system where the air responsible for the tobacco drying is now heated by hot water temperature went through a boiler converted to renewable energy, which can now also enjoy some national incentives. reactivity of the system, in case electricity lack maintenance: the PLC enables the furnaces to adapt to temporary lack of thermal power by pulling up into a safety operating step and then restore the normal conditions. The Italian case: in Italy, the Republic reward this type of plant with “white certificates”, also known as EEC (Energy Efficiency Certificates). One of them corresponds to a TEO, namely a ton of equivalent oil saved using alternative sources. Electricity and gas agency distributors, are required by law to produce with appropriate projects, a number of white certificates. If they can’t, or if they deem it appropriate, they can alternatively buy a TEO from companies that generate it on the appropriate market organized by energy markets manager (EMM). The legislation is currently regulated by Decree 28 December 2012: it ratifies what is the amount of energy savings to be achieved by the entities distributing electricity. The certification of these TEO is entrusted to energy services manager (ESM), which also deals with the projects management and evaluation.